Herb gardening isn’t limited to gardens and yards with full sun. There are many herbs that thrive in the shade. Herbs have the reputation of requiring 6-8 hours of sunlight because many of them such as basil originate from the Mediterranean. It’s good to know that there are many herbs that thrive beautifully in shady areas of the garden or yard. In fact, some herbs like the Spicebush prefer it. Herbs are the perfect complement to the vegetable garden. But some gardeners may have areas that see shade during a large part of the day. There are those areas in a yard or garden that could use a groundcover in such places like under trees or in perennial flower beds. Grows to 8 inches; zones 4-8; nice under trees; smells of freshly mown hay when crushed. Grows to 6-8 inches; zones 3-9; silvery-edged leaves bring light to shady areas. Grows to 3 feet; As an annual in all zones; use like basil or cilantro. Grows 2-4 feet; zones 4-9; beautiful in a perennial border. Grows up to 12 inches; zones 3-9; excellent choice for sloping ground as it binds well to the soil; whorled purple flowers. Grows 2-3 feet; zones 4-9; this plant flourishes and could become invasive. Grows 6-12 inches; zones 4-9; sweet scent; violet or white flowers. Grows to 2 feet; zones 4-9; one of the unofficial calming herbs. Grows to 2 1/2 feet; zones 5-9 ; will tolerate light shade. Grows to 2 feet; zones 4-8;good to use as an under-planting. Grows usually 12 inches; zones 2-9 varies with species; one of the first to bloom in spring; flower color often changes from reddish-violet to blue as it matures; excellent cover for shade. Grows to 6-12 inches depending on variety; zones 4-10; creeping thyme makes a wonderful groundcover. Grows to 1 foot; zones 5-9; tolerates light shade. Grows to 1 foot; zones 2-8; bears dark purple flowers in the early spring. Grows 1-3 feet; zones 4-9; although on the sun list, Stachys can take partial shade. Grows 6-12 feet; zones 2-6; This versatile herb grows in deep shade. Grows under 6 inches; zones 6-9; on the sun list as well but takes shade nicely. Grows under 6 inches; zones 4-9; another plant that does double-duty in the sun and shade. Herbs that grow well in shady areas often have fewer water requirements once established. The added benefit of growing these plants in shady landscapes and gardens instead of the old stand-bys (such as ivy) is that many of these herbs pull double-duty by being useful in the kitchen. 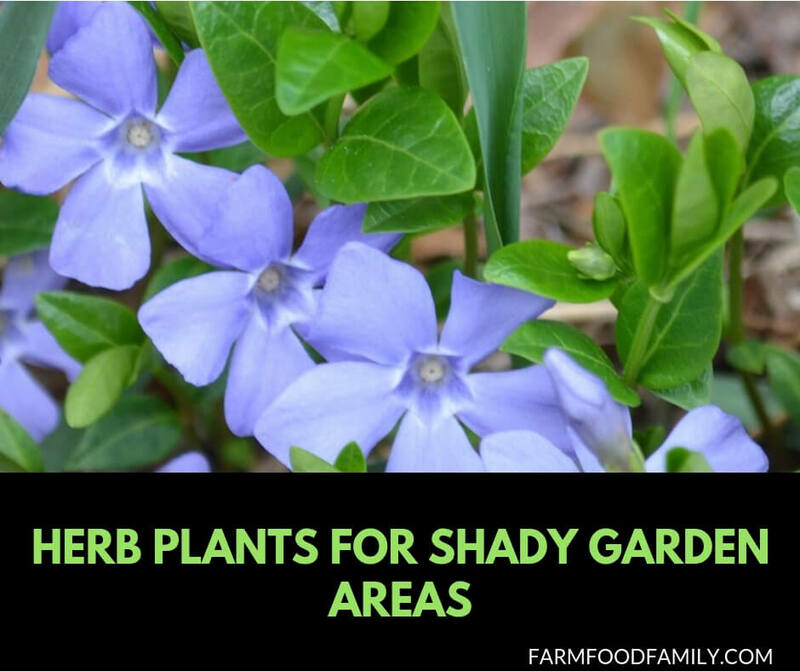 Shade herbs listed there that may be eaten safely are parsley, thyme, oregano, spicebush, Corsican mint, shiso, and lemon balm. All others would require further information before ingesting. Disclaimer – Not all herbs listed in this article are for culinary dishes. Some are for medicinal purposes which should be used under the guidance of a health care professional.